Kidney stones, constriction of the kidney, kidney failure due to Diabetes or High B.P. is faced by many people. 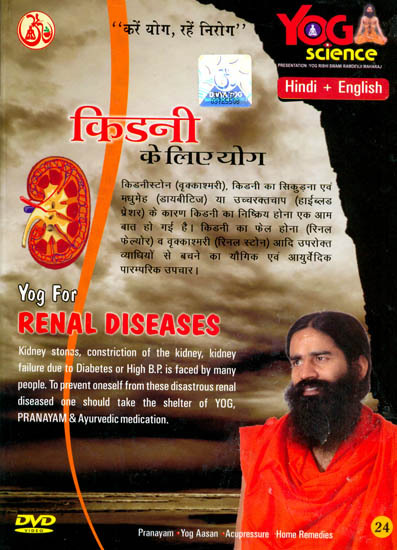 To prevent oneself from these disastrous renal diseased one should take the shelter of Yog, Pranayam & Ayurvedic meditation. Today, crores of people are suffering from renal diseases, reason being diabetes, lack of water consumption, excessive use of medicines and acidic products etc. Life can be saved through Dialysis but only temporarily which ultimately results in kidney transplantation, which again is risky. For a health, kidney and healthy system one should practice Yog, Pranayam, and Ayurvedic medication. Patanjali Yog Peeth presents in association with Garg Enterprises a Divya Yog Sadhna Production of Yog Rishi Swami Ramdevji’s “Yog Science DVD Series”.